Guided mode is a marvelous editing feature in Photoshop Elements. You access Guided mode by clicking the Guided tab. Guided mode, as the name implies, is a guided process for performing various editing tasks. When you open the Guided panel, you find a list of items for producing various edits, as shown in the figure. Not all editing tasks are contained in the Guided panel, but what you have available is an impressive list of many tasks you’ll perform often. As you peruse the panel, notice that some of the basic photo-editing items you have available are similar to what you find in Quick mode, such as Brightness and Contrast, Lighten and Darken, and other brightness control adjustments. As you scroll down the panel to reveal items such as Photo Effects, Photo Play, and Photomerge, you find some interesting, fun edits you can make with photos. The process is the same for all the items you use in the Guided panel. You open a file in the Photo Editor and click Guided. Then you click one of the items listed under a category head. For example, suppose you want to show some motion in your photo or a lightning-fast zoom appearance. The Zoom Burst Effect is one of three new Guided modes you find in Elements 12. Elements 12 also introduces the Restore Old Photo Guided Edit that takes you through the steps for restoring a photo and the Puzzle Effect that enables you to turn any photo into a picture puzzle. 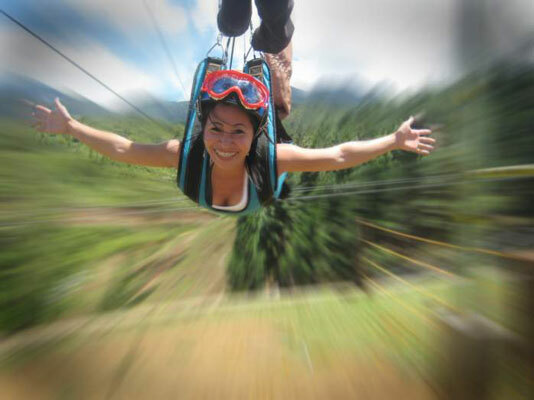 With an image open in the Photo Editor, click Guided and then click Zoom Burst Effect in the Guided Photo Edit panel. (Optional) If your image needs cropping, click the Crop tool in the Guided panel and drag the Crop tool in the image to define the crop area. Click the Add Zoom Burst Effect button in the Guided panel. Click the Add Focus Area button and then click and drag in the image the areas you want to remain in focus. Use short drag strokes as you move around the image. This example is quite simple because you have only a few steps to follow. However, even the more complicated items in Guided mode offer you step-by-step instructions you can easily follow to create a final result. The best way to discover what results you can achieve is to open photos and apply various edits using the Guided panel. Some of the more complicated options, such as creating Out of Bounds effects, offer you a link to online video tutorials to help you further simplify the process. Some items, such as Photomerge and Photo Stack, require using multiple images. 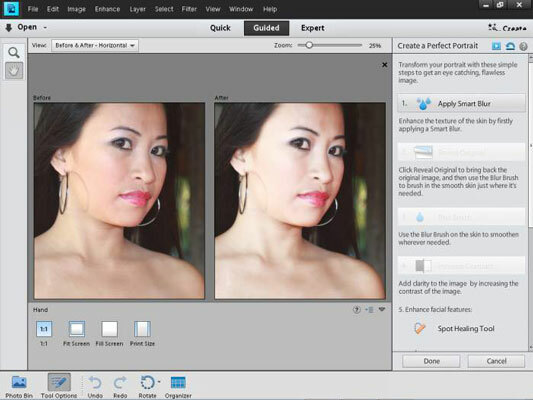 Load up the Photo Bin with photos and apply the effects to multiple images. You have effects that can help improve images that might otherwise be uninteresting photos. Experiment with the Lomo effect (which is similar to cross-processing film), Old Fashioned Photo effect, Saturated Slide Film effect, and Soft Focus effect. For a new creative experience, use the Puzzle effect that was introduced in Elements 12. For portraiture, the Perfect Portrait item in the Advanced Edits group offers an easy way to improve portrait-type images, as you can see in this figure. The best way to find out more about Guided mode is to open images, apply effects, and have a lot of fun!